Last week I posted about my excitement for winter to come, so I could put the Bolt to the test in the land of the ice and snow. On Wednesday I got my chance – in a big way. October is Co-op Month, a time for rural electric cooperatives to celebrate our connection to our members and our communities. 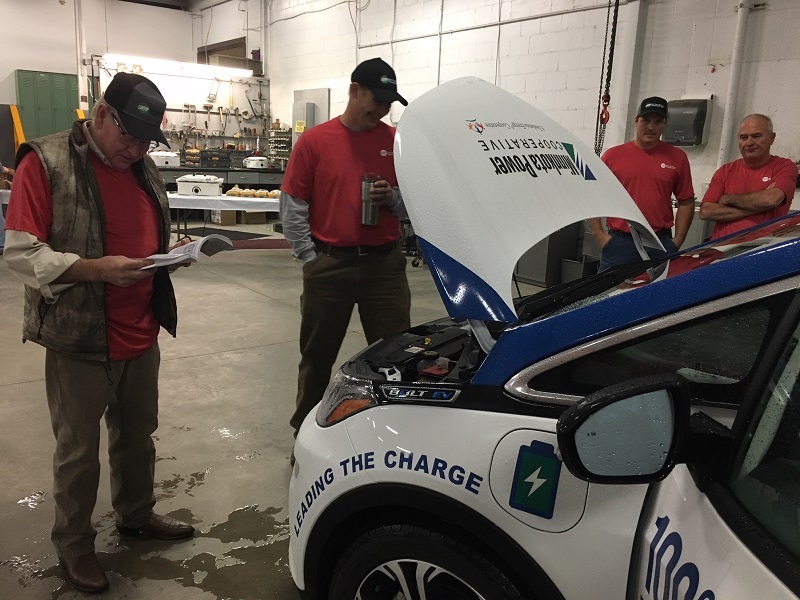 Many of Minnkota’s distribution cooperatives are holding events to mark the occasion, and some have invited me to attend with the Bolt and chat with guests and employees about EVs. The first was Oct. 10, at Red Lake Electric Cooperative in Red Lake Falls, Minn., about 50 miles from Grand Forks. They’d be serving up pulled pork, cheesy potatoes and cookies. I was in. An early October winter blast was in the forecast for the day, but it didn’t seem real until I pulled out of the garage at work. This was it. The Bolt’s first snow. Let the fun begin! You know those "first day of school" photos that hit social media at the start of fall? I needed a "Bolt's first snow" photo for the archive. Mommy is so proud! I tested the car’s handling on the slushy slop that had already accumulated in the parking lot, and the Bolt stopped on a dime. That was good news. I would have many other opportunities to test the traction over the next 100 miles. Once I got out of Grand Forks, I was hit with a tough north wind that drove my base highway energy use up past 28 kW. Typically, at the same speed, it hangs around 15-18 kW. This was going to be a battery drainer. The good news – the windshield wipers were working well on the heavy, wet snow. Since this was a relatively short trip, I felt comfortable expending some battery power on heat, keeping the cabin toasty at 68 degrees against the 34 degrees outside. As I flipped on the heat, my range dropped seven miles. Even with interior heat and a brutal wind, I would have plenty of charge to get home from Red Lake Falls. 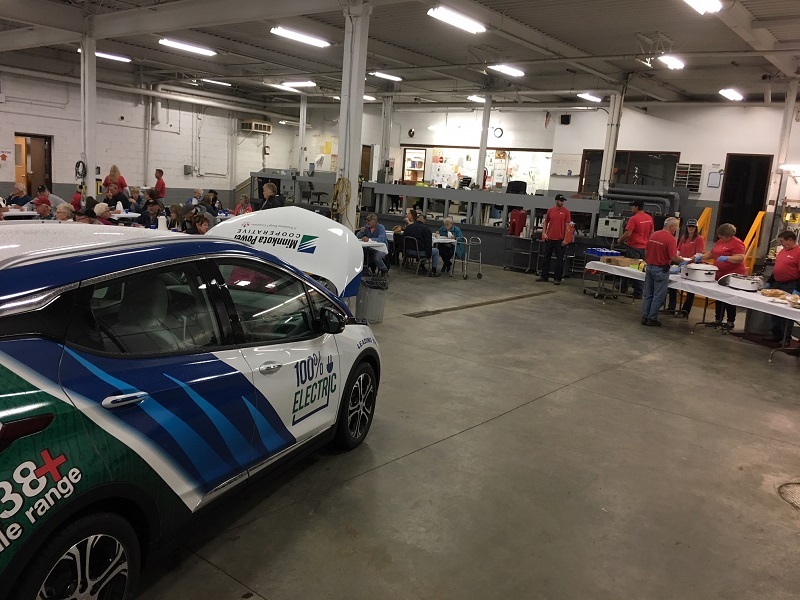 I pulled into the warehouse in which Red Lake Electric was hosting its Member Appreciation Lunch, and I could already smell the grub before I opened my door. Ah, yes – comfort food on a snowy day. Before I could even take off my coat, red shirt-clad employees swarmed the car, popped the hood and pulled out the owner’s manual. They wanted to know about the guts of this car, and they wanted to know now. These guys went to work on their own EV research right away – true car people. 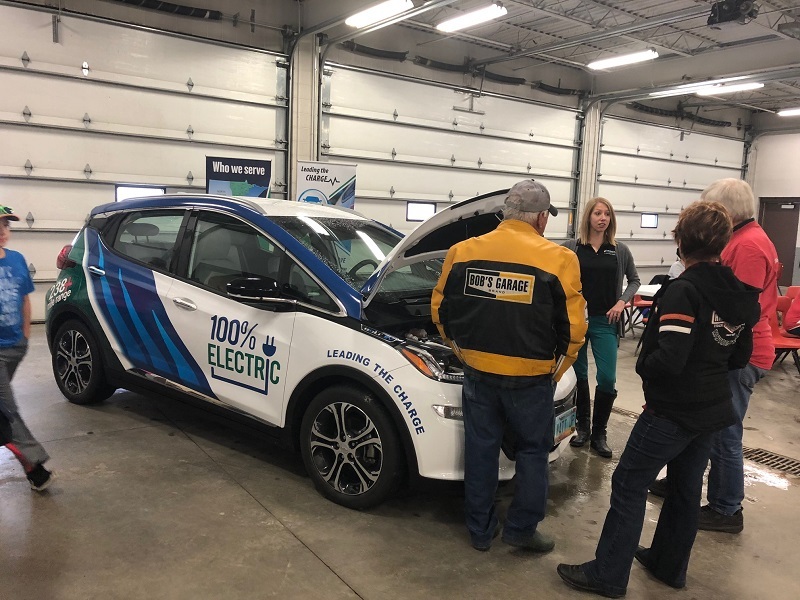 I spent the next three hours chatting with the wonderful people of the Red Lake Falls community (and beyond) about electric vehicle technology. The weather of the day certainly drove the EV conversation. Everyone wanted to know how the car handled the wintry drive there, and how it would do when the Minnesota weather started to get more Minnesota-esque. You know – ridiculously cold, snowy and windy. More than 125 people stopped by for the Member Appreciation Lunch. The Bolt was the first thing they saw when walking in, but the food was the first thing they smelled. Heavenly. I told them what I had gathered anecdotally. 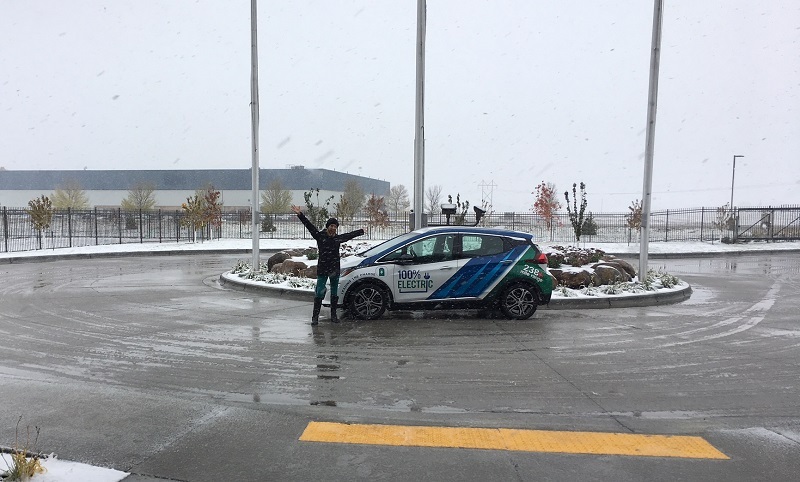 I was real about the challenges that EVs face in our part of the world – battery efficiency reduction from subzero temps, using power to heat the cabin, sometimes minimal snow clearance, etc. 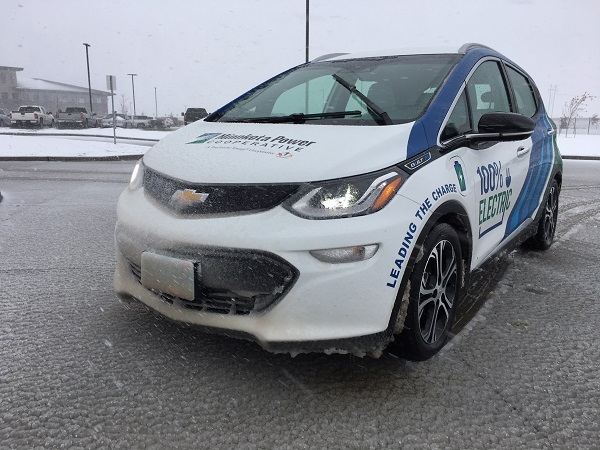 But it was also an opportunity to talk about the benefits – instant heat from being plugged in, a low center of gravity that makes rolling on icy roads less likely, and a regenerative braking system that handles the elements really well. Most members had questions about winter driving, but safety and range were also hot topics for a cold day. I actually picked up a few ideas for putting the car to the arctic test – some much safer than others – so I’m excited to gather more hard data for folks in the months to come. I left Red Lake Electric with a full brain and a chocolate chip cookie in my pocket, ready to take on the weather once again. The snow had picked up, but it still looked like fairly smooth sailing. That was until I got about 20 miles out of Grand Forks on Highway 2. Oh boy. Halfway back from Red Lake Falls, the roads were slushy, but not bad (seen above). Fifteen minutes later, I could only see about a quarter as far. Don't worry, I pulled over to take this photo – distracted driving is dangerous, folks! The wind and snow picked up, and the combination reduced visibility to only a few car lengths. The wind was also turning some of the slush on the road to ice, and I finally felt the car slip a couple of times. The fact that I, along with five other vehicles, were stuck behind two snowplows for the last 15 miles (at about 35 mph) was actually a blessing – a clear road and community of other nervous travelers. Those wipers were being put the test. They were still working well. 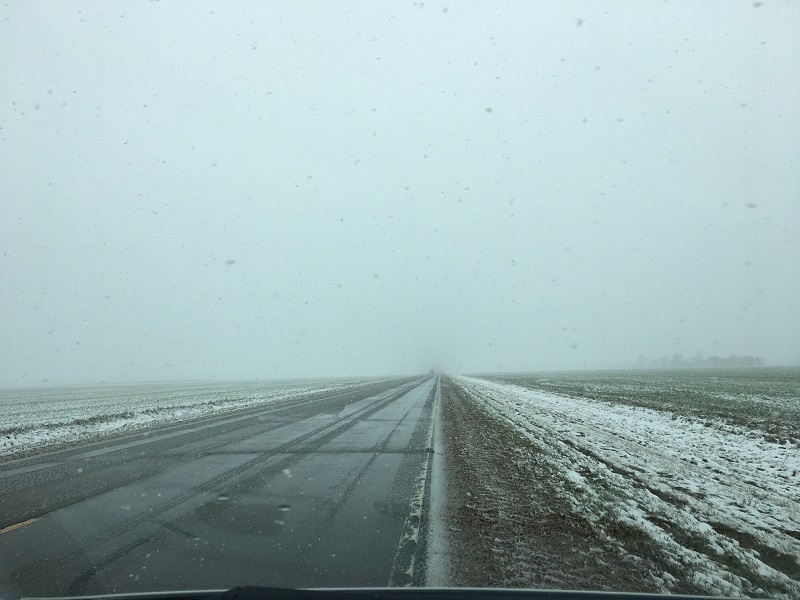 I drove the final stretch through Grand Forks, where slush and snow-covered stop lights were slowing traffic to a crawl. I made it back to Minnkota unscathed, having expended about 113 miles worth of charge over 101 miles. The Bolt’s first snow day? I’d call it a success.